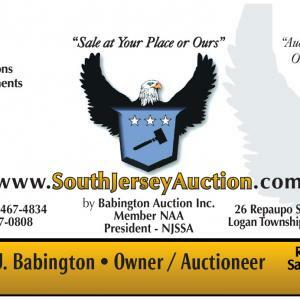 About South Jersey Auction by Babington Auction Inc.
South Jersey Auction is a full service auction company offering an array of professional services including auctions held out our place our yours. We specialize in personal property, live internet bidding, probate, downsizing, house clean-outs, estate or farm liquidations, auction estimates, general consignments. Home of the New Jersey State Society of Auctioneers President and Treasurer/Secretary. The phones are manned daily from 8:30 am to 3:00 pm and merchandise is accepted daily at our auction house from daily from 8:30 am to 4:00 pm. Auctions held EVERY OTHER SUNDAY throughout the year starting at 8:30 AM. Doors open at 8:00 a.m. Preview the Saturday before the sale from 8:30 to 3:00 p.m. One to Three auctions at once. Dock space for 30 semi trailers. 30+ ESTATES, ANTIQUES, MID CENTURY MODERN, ASIAN, MODERN, ASIAN, NEW FURNITURE, and MORE !!! Auctioning 40+Estates: Furniture | Collectibles | Jewelry | Coins | Gold | Silver and much much more! 40+ Estates Fantastic Auction 32' Wells Cargo Trailer, Massive Amount of Furniture, Collectibles, Jewelry, Coins & much much more! 40 ESTATES Designer & Decorative Arts, Mid Century Modern,Asian,Contemporary, Furniture, Rugs, Coins, Gold, Silver, Estate Jewelry, Collectibles and MORE! LIVE | ABSENTEE | PHONE BID | IN-PERSON AUCTION - wear your tennis shoes we sell over two items a minute!! This company has posted a total of 26 estate sales. Only the most recent 25 sales are shown. What People Say About South Jersey Auction by Babington Auction Inc.
Best auction in south jersey ! Place is clean and well organized. Owner is super cool and runs a nice business. They're amazing. I bought an empire sideboard through a phone bid and they arranged for delivery and I love it. It goes perfectly in my house which was built in 1836! Their customer service was outstanding. They gave me an accurate condition report over the phone as I wasn't there to view it myself. Thanks! I have been buying from South Jersey Auction since 1991. I have never had a problem with them. They are honest and fair and very accommodating. I will continue to keep coming back every other Sunday to see what treasures I will find.